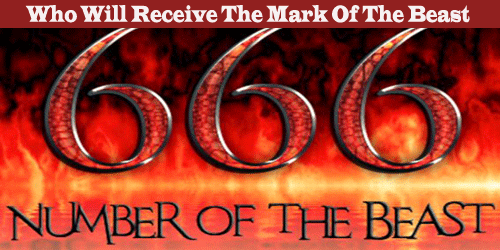 Who Will Receive The Mark Of The Beast, the man and his number 666, is definitely on the top of the scariest, misunderstood number in history. Most of the world associates the number with the devil. Some of the so-called end time preachers would like to scare you into thinking this is something to worry about however it does not have to. I remember standing in a grocery line when I was younger and the woman’s change was 666 NGN. She refused it and walked out. Some may ask, was this some force of darkness or just a coincidence? Most believe that if you receive this mark 666 you will be unable to buy or sell. As the mark will be placed on the forehead or on the right hand and has been associated with the end of times or end of the world. Is a mark always a bad thing? In America, the implants tracker in children to help keep track of them. Was believed to be the mark, some while seem saying! are Americans trying to scare themselves into an early grave or is this the fault of scandalous preachers? This mark of the beast is something that our culture has wondered about for years. Who was this mark of the beast intended for? What did the mark of the beast mean to first century Christians? Since it was them the book of Revelation was specifically written to then we should ask them what it means. If we could take a trip in time and tell them that these microchips and barcodes refer to the beast I think they would be quite perplexed since they didn’t exist in the first century. So then if it doesn’t have anything to do with us then what does it mean? You can conclude from all of this that whatever it meant to them, (first century Christians), it still means the same thing today. Let’s take a look at marks and how they were used then. When Cain killed his brother he was worried that others would try to kill him so God placed a mark on Cain so that people would know to leave him alone. We do not know for sure who the “others” were at this point so this cannot be answered. Genesis 4:15. Even though this question cannot be answered it still shows that God placed this mark on him. Another example of a mark is found in Ezekiel 9:1-6 which talks about God telling the six men to slay all of the wicked people. The only ones that were spared are the ones that had the mark. God be gracious to the people who were faithful. So a mark on someone’s forehead does not necessarily mean a bad thing. So then who in the first century received the Mark of the Beast and why? Economic sanctions were a way to get people to do what the Roman Empire wanted them to do. Christians, Jews, Romans, and all citizens had to pay homage to Caesar. So to not be able to buy or sell would create a hardship for any of them. Roman Emperors thought of themselves as divine, the emperors claimed equality with God. Domitian wanted them to treat them as if they were God and to be called Lord and God. They placed abominations in the temple. In other words, they erected statues of themselves to be placed in the temples for the people to worship and burn incense. When they did not they sometimes punished them with economic sanctions. Some were banned from the city, just as the Apostle John was where he wrote the book of Revelation. William Barclay and his commentary on the book of Revelation show the certificate and it was a certificate to be obtained annually. To those who have been appointed to preside over the sacrifices, from Inares Akers, from the village of Theoxenia, together with his children Aias and Hera, who reside in the village of Theadelphia. We have always sacrificed to the gods, and now, in your presence, according to the regulations, we have sacrificed and offered libations and tasted the sacred things, and we ask you to give us a certification that we have done so, May you farewell. We, the representatives of the emperor, Serenos and Herma, have seen you sacrificing. It should be noted that if Roman citizens or Jews refused to pay homage it sometimes would be overlooked. If Christians didn’t pay their homage to Caesar they sometimes were tortured first and then put to death. For a while, Christians got away with it because they were thought of as just another sect of the Jews. However, the more the Christians stood up for Christ the worse the conditions and persecutions got. continued with the hope that God would avenge their blood. As for today, no one will have to worry about the Mark of the Beast as it has no importance to us. Rome fell and it was Gods ultimate plan. And the book of Revelation is a book of hope for first century Christians and lets us know that we are safe with God. We will not have to go through the persecutions as they did but we will all have trials and struggles of our own to overcome. In fact, it’s not a question if God is going to win but rather how many Christians He will take with him to heaven. One person speaks a falsehood, a hundred repeat it as fact, and soon it becomes a truth…..
0 responses on "WHO WILL RECEIVE THE MARK OF THE BEAST"